Phyllis Hanlon discovers one of the oldest taverns in Worcester, Massachusetts. The sign outside the building promises good old-fashioned Irish hospitality. You can’t order any sophisticated pink drinks in fancy glasses, but customers will find Moynagh’s Tavern steeped in baseball lore, history and plenty of beer on tap. From the antique blacksmith tools hanging on the wall and the original early 20th century cash register on the counter, to the signed photos of baseball stars and a bar on which Babe Ruth bowled, the Tavern has several fascinating tales to tell. Located in the Central Massachusetts city of Worcester, the building’s first occupant in 1835 was the Idahoe Saloon, positioned ideally for the fire station next door. No doubt many a firefighter stopped by for a brew on the way home from work. When Prohibition passed, the saloon became the Bay State Bowling Alley and a regular haunt for the famous Babe Herman Ruth, who by then had been traded to the New York Yankees. Throughout the late 1920s, Ruth often visited Worcester in the off-season and befriended the baseball coach at nearby Holy Cross College. The two regularly visited the Bay State Bowling Alley, to the delight of the Yankee management. They preferred Ruth engage in this type of entertainment rather than over-imbibe or visit brothels, his usual distractions. Two years after Prohibition was repealed, Robert Moynagh Sr. opened his tavern across the street from the bowling alley. On December 30, 1935, the city awarded his establishment a liquor license that, to this day, is still valid and claims the honor as the oldest continuous license in Worcester County. In 1948 when the Bay State Bowling Alley shuttered its doors, Moynagh bought the building and began renovations. During the reconstruction process, Moynagh discovered that the Babe had trod on this very floor. He decided to preserve a piece of history and used one of the bowling alleys as the bar surface. The storage room also contains two of the original alleys. In more recent years, catcher Carlton Fisk, who played for the Boston Red Sox (1967 to 1980) and for the Chicago White Sox (1981 to 1993), brought some excitement to the establishment with an impromptu visit. In town to conduct a workshop, he ventured out of his hotel to grab a beer. His search led him to Moynagh’s where he fit right in with the clientele. After enjoying several brews, he hopped behind the bar and assisted the bartender, to the delight of patrons. Some four hours later, he called it a night, but not before signing autographs. 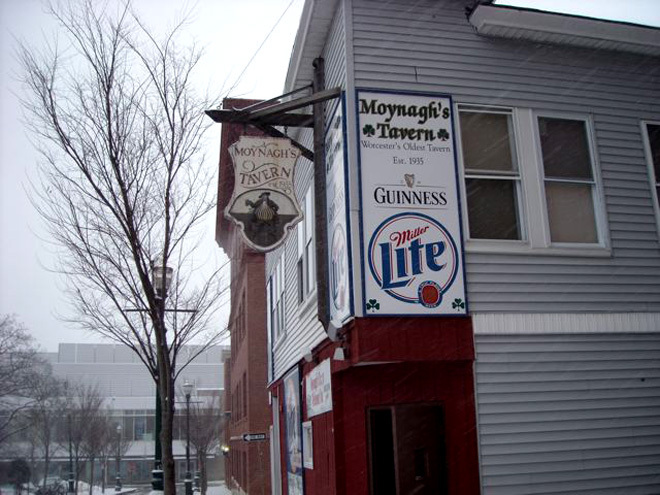 In 1995, Robert Moynagh, Jr. assumed ownership of the tavern when his father passed away. The 68-year old continues to operate the tavern, much the same way his father did. With the help of his 33-year old son Tim, they continue the tradition of serving the mostly blue-collar crowd. “The theme of my father’s ownership was dedication to the working man. He was a great friend to anyone who came in. When people needed rent money, he was always ready to give,” the older Moynagh reminisces. Reflective of that altruistic spirit today, the tavern assembles teams that participate in the Passion Plunge, a mid-February dip in the Atlantic Ocean to raise money for Special Olympics. Six out of the last seven years, Moynagh’s team has been state champion in fundraising. With the appearance of a live band twice a year and its annual St. Patrick’s Day bash, the Moynagh Tavern strives to retain that no-frills, “community” atmosphere. “We’d love to hand down the tavern for many more generations,” says Tim. 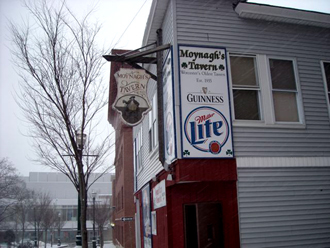 If Ruth had the chance to revisit his old Worcester haunt now, no doubt he’d give two thumbs up for Moynagh’s Tavern, and maybe even enjoy a couple of beers.